Security of the Identity Management system or privacy of the users? Why not both? 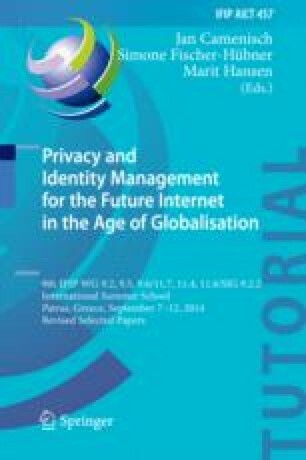 Privacy-preserving Attribute-based Credentials (Privacy-ABCs) can cope with this dilemma and offer a basis for privacy-respecting Identity Management systems. This paper explains the distinct features of Privacy-ABCs as implemented in the EU-sponsored ABC4Trust project via example usage scenarios from the ABC4Trust pilot trials. In particular, it aims for a deeper insight from the application perspective on how Privacy-ABCs can support addressing real-life Identity Management requirements while users’ privacy is protected.